This book presents the essential steps, techniques and tools to inspire you on your journey towards innovation, illustrated by genuine case studies. This is the first phase of the design thinking process in which the project team approaches the problem context from different points of view. Stage of analysis and organization of information collected, making it possible to detect patterns and develop challenges to help understand the problem. This is the moment to generate innovative ideas for the project. To do so, tools such as brainstorming and co-creation workshops are used. It is time to get the ideas off the drawing board. The prototype will help to test and validate the ideas generated.  I want to download the Design Thinking book now! Computer Engineer at PUC-RJ (1990), MSc. in Computer Science at IIT – Illinois Institute of Technology (1992), and Ph.D. in Computer Science at IIT (1995). Global CEO of MJV Technology and Innovation. Electrical Engineer degree (ITA, Aeronautical Institute of Technology, 1966), Master in Electrical Engineering and Computer Science (UCB, University of California at Berkeley, 1969), Ph.D. in Computer Science (UCB, University of California at Berkeley, 1972). President of MJV Technology and Innovation. Master in design by PUC-Rio, bachelor's degree in design with a focus on Visual Communication and Product Design by ESDI/UERJ and a course in digital media at German design school HfG Schwaebisch Gmuend. Collect data about your target audience in the context they live in and with the least interference possible. Find out their yearnings and expectations to support relevant decision-making and prepare the user for collaborative sessions. Learn more by watching the explanatory video. It’s a meeting with several users and stakeholders in order to obtain deeper layers of information about the user’s relationship with the researched context. This technique allows you to extract feelings and unconscious impressions, which would not be verbalized in interviews. Personas are fictitious characters created to generate and validate ideas. They are developed from the synthesis of meaningful behaviors observed during field research. It is the grouping of Insights Cards according to categories based on affinity, similarity, proximity or dependence. This diagram makes it easier to see the macro areas that delimit the subject at hand, its subdivisions and interdependencies. Insights consisting of reflections based on actual perceptions obtained along the exploratory, desk and/or indepth researches. They are findings that point to solution opportunities for the project. You know that “a-ha” moment? It’s usually an insight!